The real picture post cards that accompany this post were taken in 1929 for the Newark Museum by the photographer Herman G. Cuthbert. 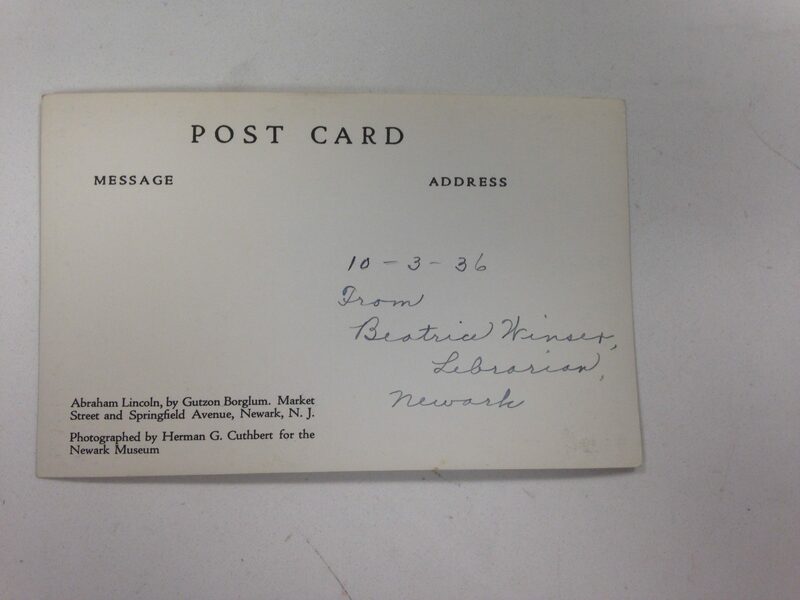 They were inscribed by Beatrice Winser, Newark Library and Museum Director, and sent to an unknown recipient in 1936. She wrote, ” Newark, since the World War, has changed amazingly. 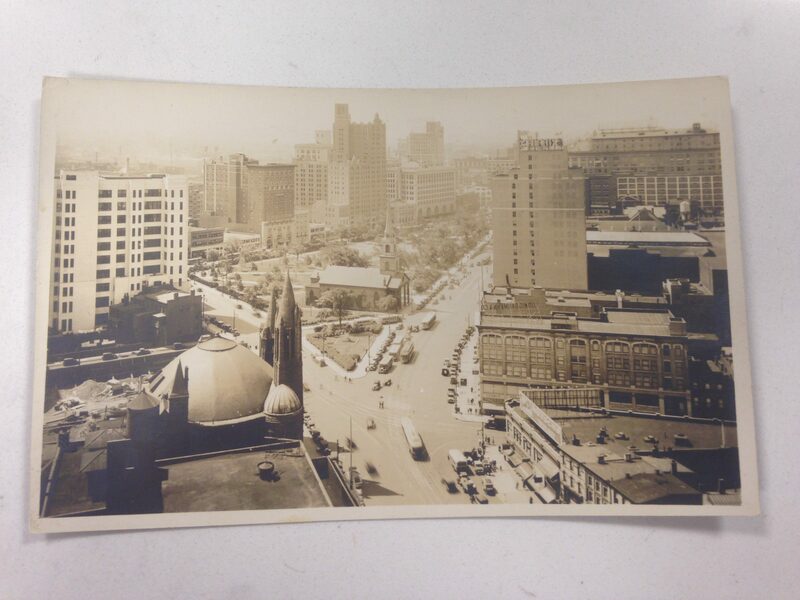 New high buildings have cut through its skyline; in them one finds the clerical forces of many firms whose office address is New York.” The image was taken on July 1, 1929 from the roof of the New Jersey Bell Building and looks south toward Military Park. The views on the other cards include some familiar sights although the years have wrought some changes. This collection of images captures a city in its prime. 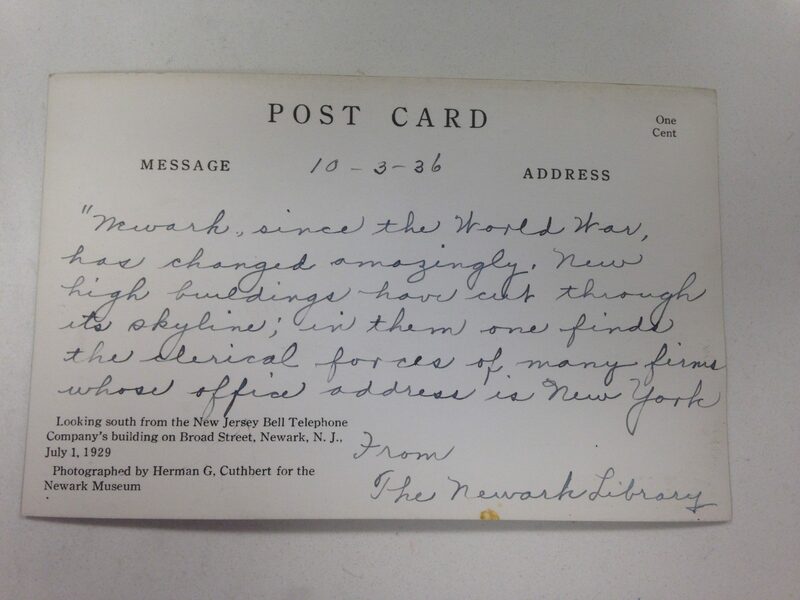 The sender of these post cards, Beatrice Winser , is not a familiar name to present day Newarkers and I hope this post will draw some attention to her many achievements. Beatrice Winser ( March 11, 1869 – September 14, 1947) was the director of the Newark Public Library and the Newark Museum. Born in Newark, her father was a newspaper reporter and a diplomat . Shortly after Beatrice’s birth he left the New York Times for a post as consul in Saxe- Coburg and Gotha. Beatrice was educated abroad and became fluent in German, French and English. 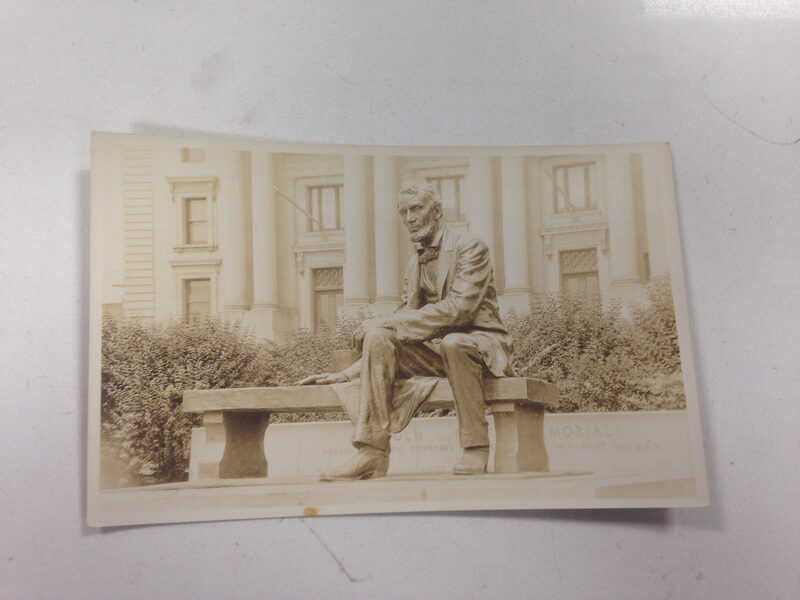 In 1888, Winser attended the Columbia University Library School, the first library school in the United States, founded by Melvil Dewey the previous year. She joined the Newark Public Library as a French and German cataloger in 1889. In 1894, she became assistant librarian under Frank P. Hill, the first librarian of the Newark Public Library. Hill left in 1901 to run the Brooklyn Public Library. Winser ran the Newark library for seven months following Hill’s departure. The trustees, while agreeing that Winser was qualified for the job, wanted a male librarian. John Cotton Dana assumed the position in 1902. Never the less, Winser and Dana had a productive relationship that lasted until Dana’s death in 1929. Early in her career at the Newark Public Library, Winser offered books to public school classes that didn’t have libraries at school, opened libraries in union halls and made sure the library paid attention to the needs of its patrons. In 1915 , Winser was appointed as the assistant director and secretary of the Newark Museum. She became the first woman in Newark’s history to become a member of a governing body when she was appointed to the Newark Board of Education the same year. She also campaigned against restrictions preventing women from working in military libraries during World War I. She was a charter member of the New Jersey Library Association, founded in 1890, and served as the associations president both in 1907 and 1921. Additionally, Winser was a member of the American Library Association Council of Fifty from 1909 to 1913 and served as second vice president in 1931. In 1923, she campaigned against state labor legislation that would prevent women from working during the evening hours. Upon the death of John Cotton Dana in 1929 Winser assumed leadership of the Library and the Newark Museum, which had been founded by Dana in 1909 on the top floor of the main library. She headed both institutions during the great Depression, which strained budgets and required scaling back services and renovations. In the 1930s, she served as chair of the New Jersey Art Division of the WPA(Works Progress Administration), was involved in the founding of Dana College and was awarded an honorary LL.D. after its merger with the University of Newark the predecessor of Rutgers Newark and fought against censorship of foreign materials by the United States Customs Service. During World War II , Winser presided over efforts to satisfy new information needs due to the war and to provide books to soldiers. Toward the end of her career, Winser became archivist of the New Jersey branch of the World Center for Women’s Archives(NJWCWA). Its purpose was to collect and preserve in a central archive all historical records related to women. In 1942 she resigned from the library, citing interference by the trustees in the management of the library. She continued to head the Newark Museum until shortly before her death in 1947. Very interesting. Thank you John. Thanks Charlie ! Glad you’re checking out the blog. Thank you! Through research on the University of Newark (predecessor of Rutgers-Newark), I’ve come across correspondence written to and from Beatrice Winser in unexpected places. It turns out she was also a trustee of the University of Newark, and she contributed during its formative years in collaboration with the university’s president. It appears to me she deserves more credit for her deliberate hand in the recognition of John Cotton Dana’s legacies. It’s truly a shame that she isn’t better known these days. I would welcome the opportunity to expand my post if you have any information you’d like to share. I would gladly post something under your name. I do live in Newark and would be available to meet should that be necessary. Thank you for comment.